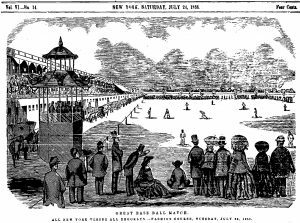 The game of baseball started taking shape in the 1840s when a volunteer firefighter and bank clerk named Alexander Joy Cartwright together with some of his buddies formed the New York Knickerbockers Baseball Club. Cartwright invented the rules which made the game what we know it to be today; the diamond shape field, foul lines, and other features. 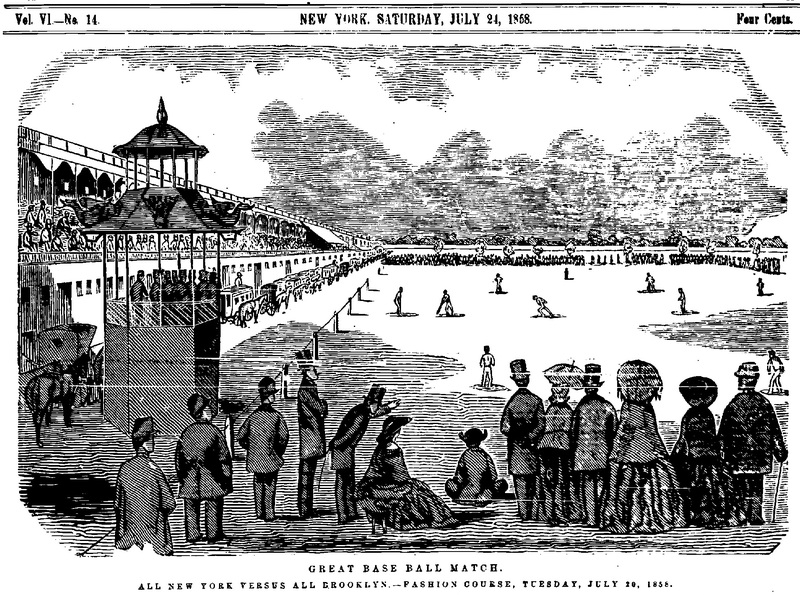 On June 19th, 1846, the Knickerbockers played a group of Cricket Players for what is considered by many to be the first Baseball game in history. The Knickerbockers were clobbered 23-1. The game took off after this. Men from all sorts of trades formed teams. There were over 50 clubs in the New York area alone by 1858. Special trains took people to and from the games. A rivalry developed between the Brooklyn and New York teams. Leaders of Brooklyn teams challenged the New Yorkers to a game. Then each city chose their best players to play in what would become the first all-star game. It took place on this day, July 20th, 1858. Over four thousand people attended. It was also the first game with a cover charge, 50-cents! New York won 22-18. After the All-Star Game, Baseball only got bigger. Not even the Civil War could slow its progress as soldiers played it on battle fields between enemy engagements. After the war, peaceful parks throughout the country were scenes of great games. “One of the most appealing things about Baseball is that it highlights the individual like no other game does. Each individual has his specific place on the field; each individual has his turn at bat. In other sports you can go continually to your best guy. Babe Ruth still only batted once every nine times. So it’s the individual within the context of the group. And the individual is highlighted, but in the end his performance means nothing outside the group, outside the community.” — Both quotes from the Documentary, Baseball, by Ken Burns. This entry was posted in Uncategorized on July 20, 2017 by dsheridan.